Located on the shores of Hudson Bay, Churchill is over 1000 kms north of Winnipeg and completely inaccessible by roads. There are only two ways to get to Churchill, air or rail. Today it is a popular destination for tourists viewing polar bears and beluga whales. Churchill has been on my list for a long time, but now that Ray has retired I’ve finally convinced him to join me. We went to Churchill to see Beluga Whales. Thousands of whales amass at the Churchill River Estuary around mid-July to mid-August to give birth and feed on the plentiful capelin here. The plan was to kayak with them, but one of the things I’ve learned about Churchill is that everything is weather dependent. 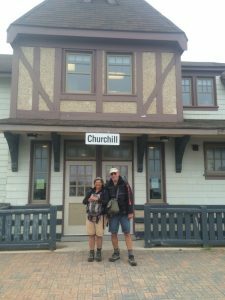 There are no roads to Churchill, so one has to get there by air or rail. Flights are usually in the $1200-$1500 price range and are often booked in combination with a hotel and tour package. The train from Winnipeg isn’t much cheaper and takes two full days. If you’ve ever spent two nights on a train in economy you will know not to try that. If you are heading up in the summer, there’s a third option. We drove up to Thompson and boarded the train there. With only one night on the train we felt empowered to spend it in economy and our fare was only about $100. The drive up to Thompson is a cultural trip all of its own. 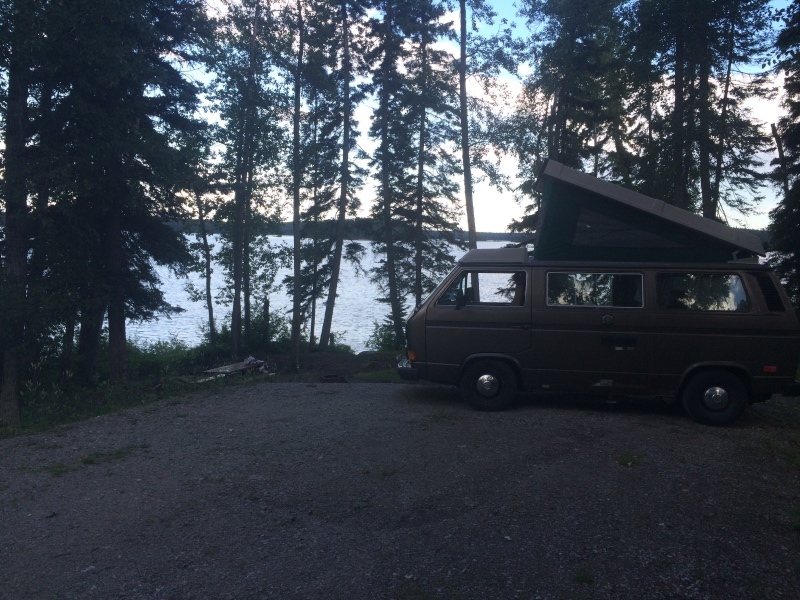 We drove up to Thompson in our trusty Westfalia, which turned out not to be so trusty on this trip. 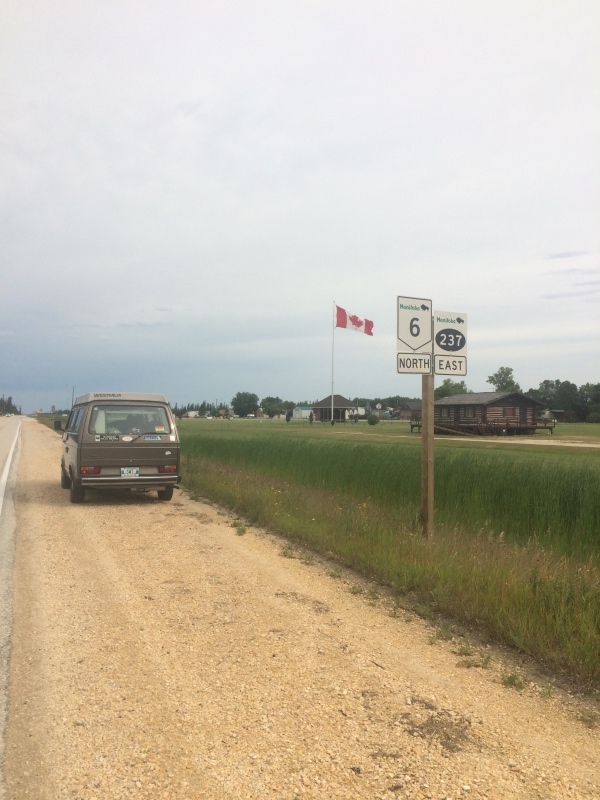 It’s a long and isolated drive along highway 6, over 750 kms from Winnipeg straight north. I don’t want to offend anyone, but there is really nothing at all to see between the Interlake region on Lake Winnipeg and Pisew Falls, almost at Thompson. We camped at the beach at Hnausa Beach Provincial Park just north of Gimli to break up the long drive, and then camped again at Paint Lake Provincial Park, stopping to visit Pisew Falls along the way. Somewhere along that long and boring drive, our two back tires began to separate. Luckily we didn’t notice until we got to Thompson so we didn’t worry all the way up, and we were able to get the tires replaced for reasonable cost while we were up in Churchill. When you board the train to Churchill, whether it’s from Winnipeg or Thompson, you can’t be in a hurry. This is a slow train. Boarding the train is like entering a different era – the train is old but mostly clean. We did our best to grab a family seat – two seats that could be turned around to face each other. This is only possible if the train isn’t busy. There is a restaurant on board but this is no Rocky Mountain east-west train. Expect cafeteria food at best. There’s an observation car but it’s only accessible to first class passengers for some reason. The scenery outside the window never changes – just desolate muskeg, hour after hour. I could just picture the swarms of mosquitoes and black flies that must be out there. I pictured the explorers of the past, or the adventurers of today, that would have braved these elements. It’s an uncomfortable night, but at least it’s only one. We arrived in Churchill in the morning, too early to check into our hotel. 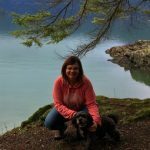 We stayed at the Bear Country Inn – a basic but comfortable, clean and inexpensive hotel. When I booked I thought it was conveniently located just around the corner from the train station, but the jokes on me. Churchill is a lot smaller than I thought, and everything is located near the train station. It was too early to check in, so we did what we always do – dropped our packs and went for a walk. Churchill was a complete surprise to me. After all the advertising I’ve seen for this tourist mecca, I expected a larger community. We walked right out onto the shores of Hudson Bay, and there were the belugas we had come to see. 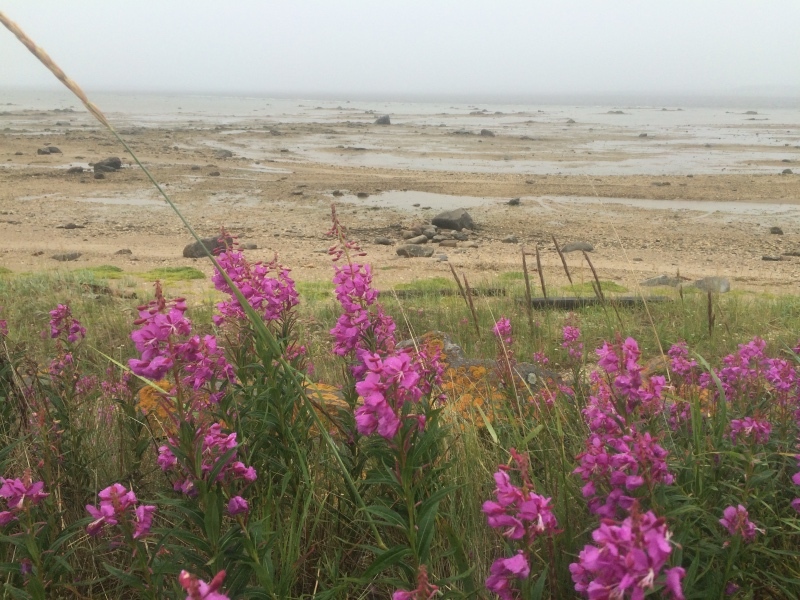 The desolate shoreline surrounded by gorgeous wild arctic flowers was wild and exotic. We were the only ones out here. Walking a little further down the shoreline, I could see the back of a sign. 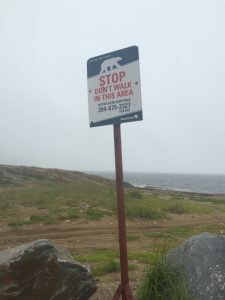 So I really thought polar bears were only a danger in Churchill in October. Not so. The sign was warning us not to walk here – polar bears sleep in the rocks on the shoreline and can easily be disturbed and surprised. By evening a patrol will regularly drive past here on an ATV, looking for bears and stupid people. While visiting, a bear tried to break into the restaurant at our hotel, leaving his huge paw marks on the door. If you find yourself the reason for the destruction of a polar bear, be prepared for a lifetime of ostracizing – it’s never the bears fault. I found the inability to walk freely here claustrophobic. 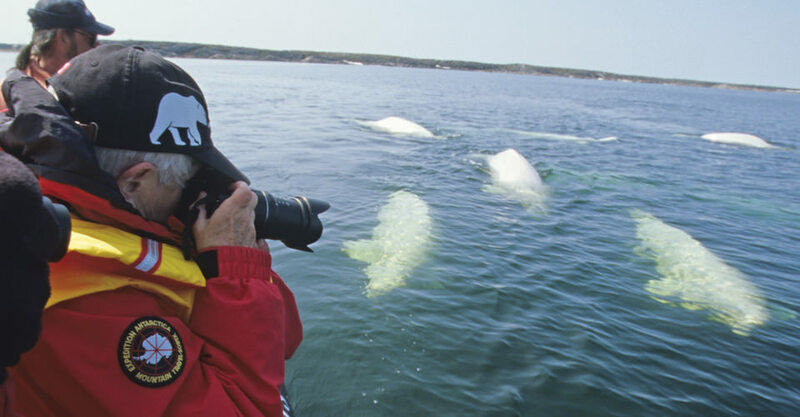 One of the main reasons tourists come to Churchill in the summer is to see the thousands of Beluga whales that come to the mouth of the Churchill River to give birth and feed on the plentiful capelin. There’s no need to search for the whales, they are everywhere. The best way to see and interact with belugas here is to kayak with them, and that was our plan. We booked our tours through the only local tour company Sea North Tours. They are a great company and were located right across the street from our hotel, but even they couldn’t control the weather. We were only in Churchill for two days, and neither day was saf for kayaking. That doesn’t mean we didn’t get a lot of up close and personal time with the whales though. When we realized we weren’t going to be able to kayak, we hooked up with three women we met and booked a private zodiac tour. It was cold and wet and rough the day we went out, but we saw hundreds of whales that came right up to our boat to see us. The whales are calving at this time of year, and you can tell the different ages of them by their colour. White belugas are mature, but the babies are still grey. 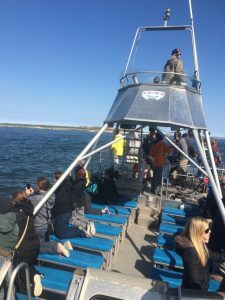 We were viewing whales of all ages. 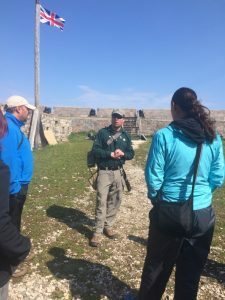 A tour to Fort Prince of Whales should be mandatory on a visit to Churchill. 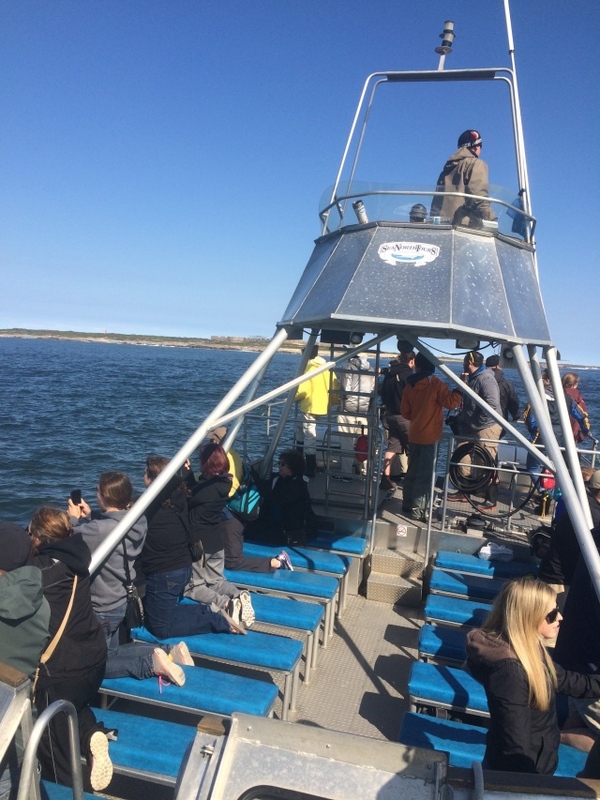 We went with Sea North Tours again, and they took us out on a whale watching boat. 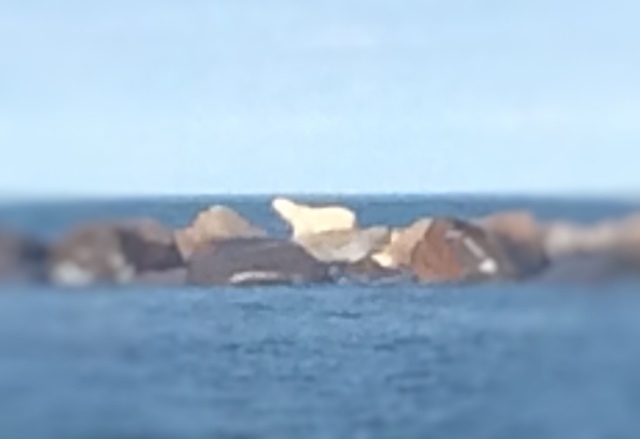 We stopped to view the whales on the way and then even sped a polar bear on the shore just north of the fort. Our guide at the fort carried a gun, for the polar bears and another park staff drove an ATV out onto the tundra continuously to keep the polar bears at a safe distance from us. 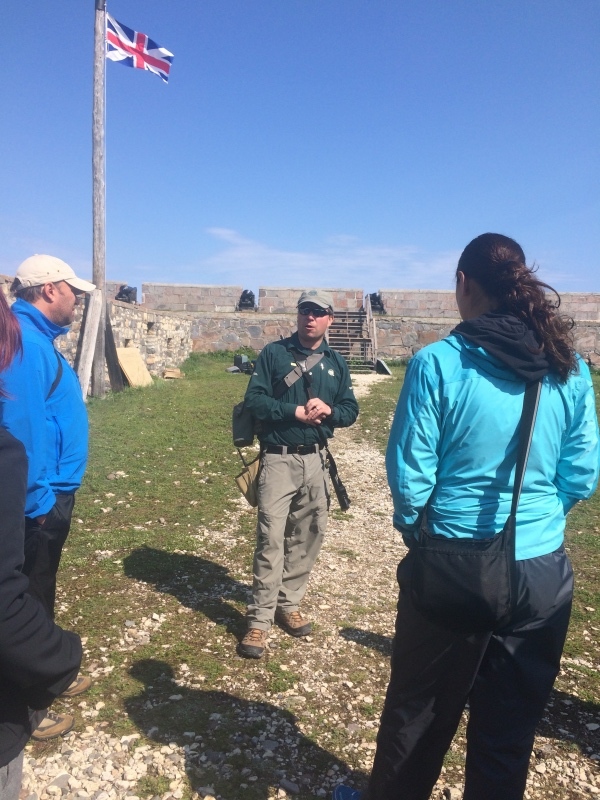 Our guide at the Fort was fantastic. He brought the past alive as he relayed the history of this northern outpost. Completed in 1771, the fort was surrendered to the French without a shot being fired only about 10 years later. While listening to the stories, we all watched a drama unfold on the tundra, as a polar bear repeatedly tried to approach us and was chased off by an ATV. As our last evening ended in Churchill, the sky cleared and we got to experience the most amazing Arctic sunset. 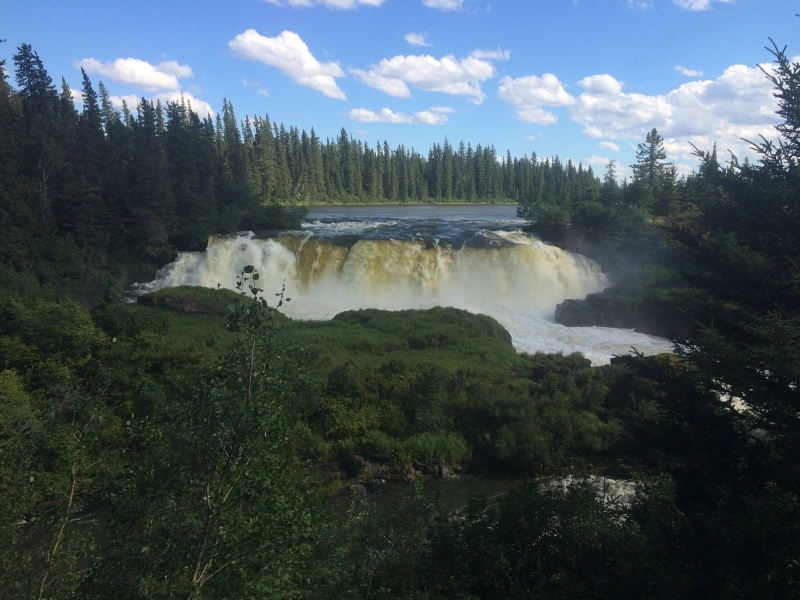 We also toured the town’s two museums and ate dinner every night at the amazing Tundra Inn. I know people who grew up in Churchill, and now that I’ve been here I have a new appreciation for what that means. The train boards in the evening – homeward bound.